Due to Eddison`s lack off outside time and activity, we have to make a huge continuous effort to find a variety of ways to give him ample exercise and physical stimulation, to ensure we can keep his fitness in line with his peers and ensure development of his gross motor skills. A big part of us being able to achieve this, is the provision of Eddison’s indoor garden where he has constant access to physical stimulation; and as if to prove this point, this weekend he mastered the unaided scale of his climbing wall (see facebook for video). Another big part in this, has been an activity that he has done for nearly two years – RugbyTots. Thanks to support from their Coach, Steve Creme, Eddison started attending not long after diagnosis. This indoor activity is run from a village hall, which Coach Steve prepares before his arrival by shutting the curtains and closing windows. This is the only place where on a weekly basis (term time) Eddison can run about in a large area in safety and he loves the opportunity to streak back and forth the hall while practicing scoring Tries and then practicing his throwing, catching and kicking. Its a really special class for us as it offers him freedom to express himself and feel stretched whilst enjoying the company of other boys his age. There are many major milestones being a parent, and your babies trotting off to nursery then school, ranks pretty high up there! Last month, we were just the proudest parents as we watched Eddison alongside his best friend Finlay make that big transition into nursery. When Eddison was first diagnosed one of the many things whirling around our heads was “how on earth is he going to go to nursery, school and beyond”. 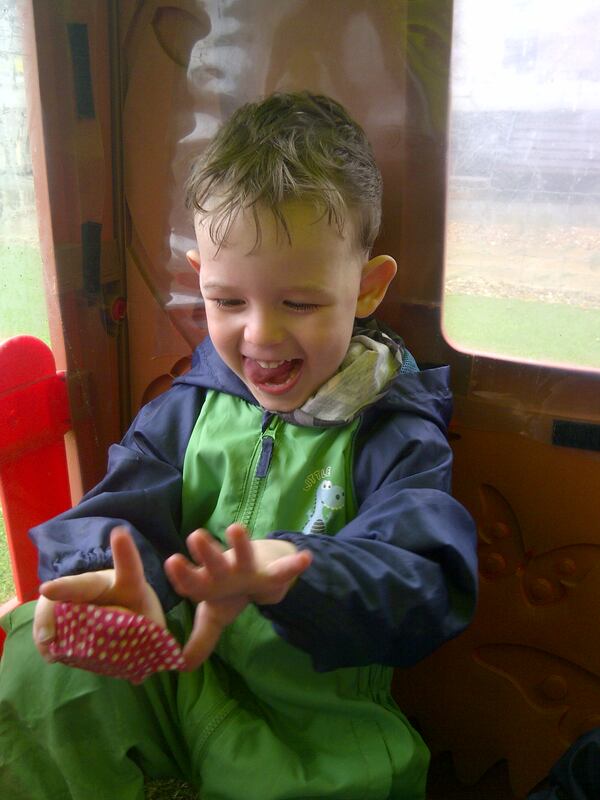 Initially comments from people suggesting that a mainstream placement would not be possible, filled us with panic and we assumed that nursery would be a complete `no go` and he would need to be home schooled. Just before Eddison turned two we decided we needed to face this head on, and find out exactly what the challenges, issues and obstacles were going to be so that we could devise a plan. We made an appointment with the local primary school, who gave us lots of reassurance as well as the sound advice that we needed to get the ball rolling asap in order that the challenges could be met in time for him starting school. So armed with some contact numbers we left feeling ready to make it happen. After a few bounces on the phone between departments we soon got a call from Denise who advised us that she would help guide us through the daunting road ahead – and guide us she did!!! After 16 months of work; with numerous nursery visits, meetings, completed forms, funding applications, and briefings; a place was secured for Eddison within our local, mainstream early years nursery. With thanks to Local Authority Funding the venue was fitted with Dermaguard Film (UV blocking) and a light meter was purchased for the staff. Special funding has allowed the allocation of a 0ne-to-one Key Worker to assist Eddison in meeting his safety needs. So the windows were filmed, the lights were safe, the nursery staffed were trained (by our XP Outreach Nurse Sally), Eddison was introduced to Sue his new Key Worker and we were almost ready, just a few more things to work out. An emergency evacuation plan was worked through to ensure Eddison could be evacuated from the building in the event of a fire, without being exposed to risk and without being stood potentially in high summer time temperatures. We went along to read one of our Little Ted stories to the nursery children to explain about Eddison`s condition and the importance of his hat and gloves staying on, and we explained a little about UV and gave them all a UV reacting bracelet so they can see the colours change to reflect when Eddison needs to be protected (thanks Andrew and Nanny for the long night stringing, lots of beads!) and communications were sent out to the parents to back this up. And so at last after lots of combined effort from all involved Eddison enjoyed his first day at nursery, where he played with his new friends and even enjoyed time outside in their little garden. To say it`s been an anxious time is an understatement as prior to this Eddison has never been outside without Andrew or myself there to check his protective clothing, and we have always done his cream and got him ready; so handing this over to others has been very hard. As has fighting the urge to drive by and check the windows are closed! But we have immediately seen how much he is getting from his time there and how much he loves the additional stimulation beyond the confines of home and we just burst with pride to see how well he has adapted. Learning to tolerate another person previously unknown to him, applying his sun cream and dressing him ready for outside play, learning to put trust in others to keep him safe without Mummy and Daddy being there, being compliant to move on request to allow for opening doors etc and having the confidence to tell the staff when he doesn’t want to go outside because it`s too hot, or he want to come inside. All quite a tall order for a three year old on top of the typical stresses of starting a new adventure at nursery! 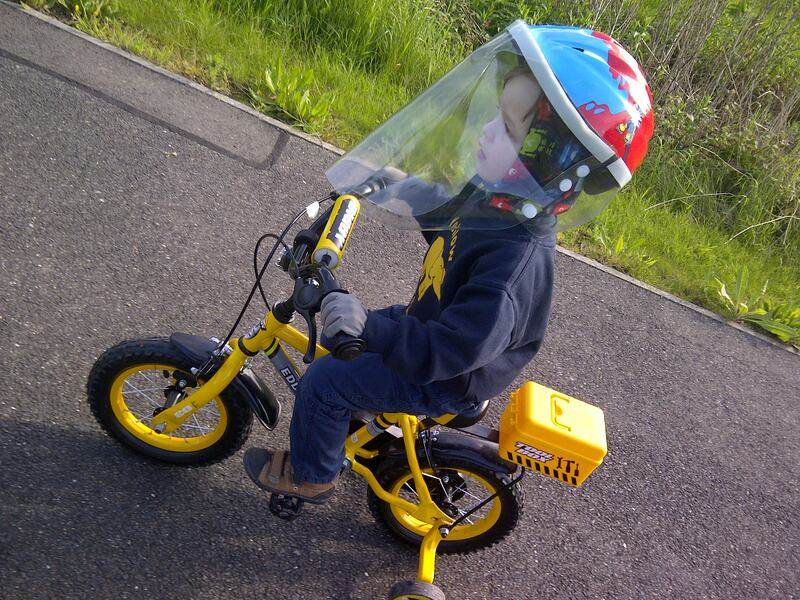 Two years ago, we could not have envisaged how `normal` this could feel and let alone imagine the possibility of him popping on his little bike and cycling off to nursery as we did last week! 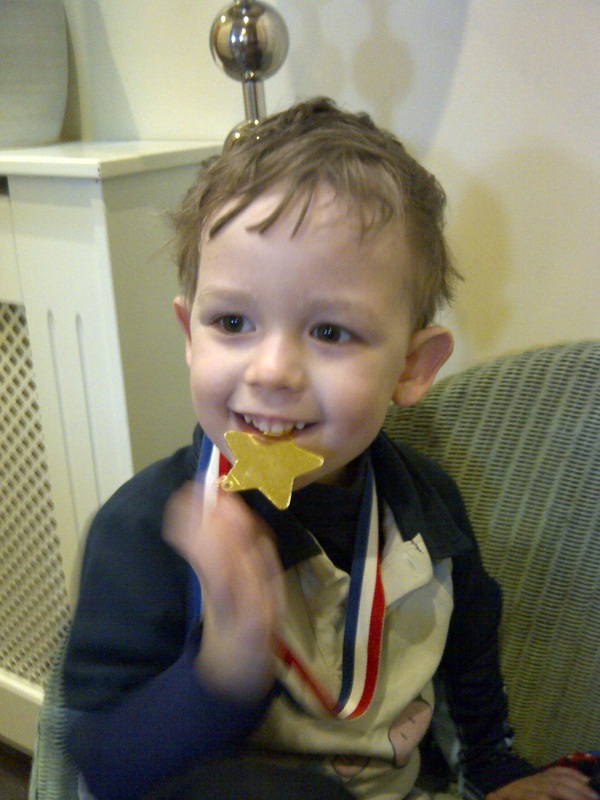 We cannot say enough how much we appreciate the efforts of the wonderful Denise who has helped us through this process and to the staff at Eddison`s nursery who have fully embraced Eddison and his needs. They have taken on board the seriousness of his condition and have endeavoured to normalise it as much as possible so that he can participate fully during his attendance. Thank you Denise, Abigail, Emma and of course special thanks to Eddison`s Key Worker Sue, who gets up to her ears in sun cream everyday and always with the biggest smile and enthusiasm! So what next…Well no time to sit back and relax, now we are back on the road with Denise to get the wheels in motion for starting primary school next year! p.s. After a few weeks of much distress for little Raife who missed his big brother terribly, he also is adapting to the changes, and is enjoying his own new explorations as we enjoy time together having extended play in the garden, lunch outside, park trips and swimming; and Eddison loves hearing about Raife`s fun times as well as sharing his nursery stories at the end of a fun filled day. Hat and Gloves Not Required! It`s a bit of a damp afternoon here; which to be honest is a welcome reprieve from the week of 22 degree plus temperatures we have had here this week. 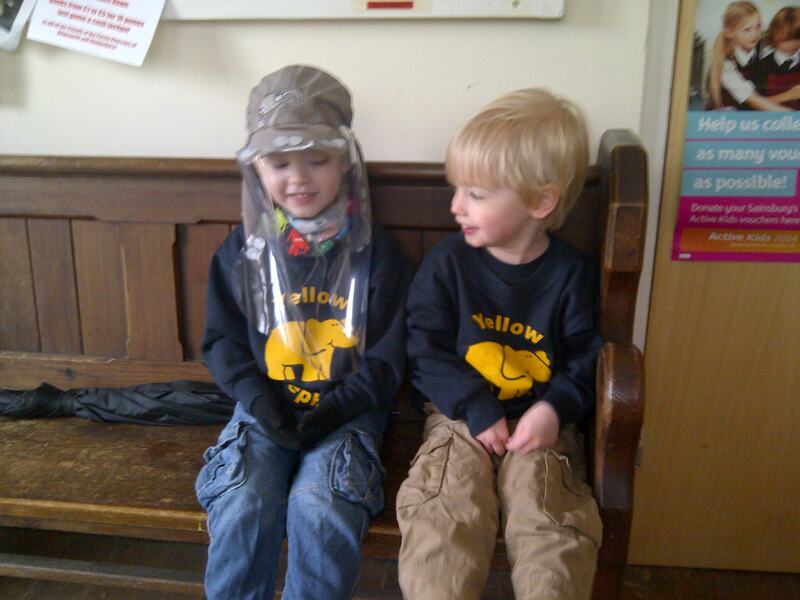 So it hasn`t dampened our spirits as we had a very special treat planned for this afternoon! While Eddison was at nursery we set about feverishly on our project to UV film the boys Wendy House, and despite the rain we managed to finish just in time to pick him up. So we dashed home, popped on the rain suits and headed out for the official opening of the UV safe Wendy House which we of course celebrated with a cheeky cake. I think the picture below speaks for itself about the joy he felt when he dived in, whipped of his hat and gloves (shortly followed by his boots), and enjoyed his first visor free outdoor, daytime picnic. Eddison`s sheer delight as he looks at his bare hands, outside in the daytime! Thanks to our UV proofed Wendy House. Breakfast alfresco on tomorrows diary!! Following our blog back in January, we are thrilled to announce that this project has officially gone LIVE and has been launched by CIAT this week. The call to their Members to bring together their expertise, in an attempt to develop an affordable UV shelter, was made on their website this week followed up by industry e-bulletins and the Institutes AT Journal. We hope to have a selection of interested parties assembled (individual and corporate) by the early summer after which the fun really starts – getting down to designing!! Our thanks to those who contacted us with their input for inclusion within the brief. We will continue to keep you all updated as the project progresses so watch this space!